Capt. 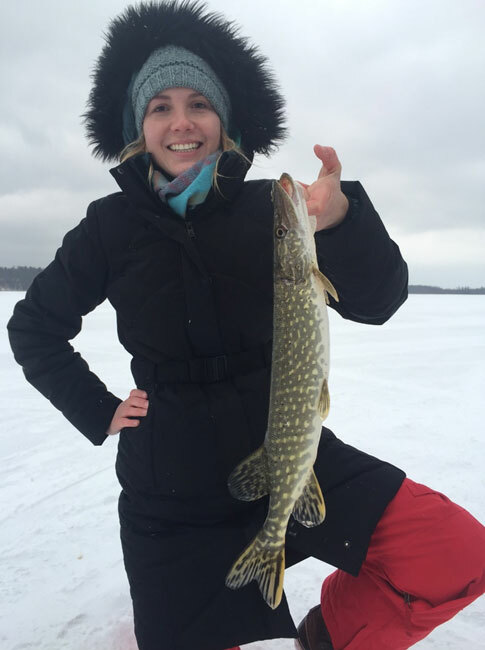 Chad Dilts helps Brittany, a first time angler, bring in a beautiful pike on a tip up. Capt. Chad Dilts catches a nice pike on 1lb test line while ice fishing in northern Michigan. Sport Fish Michigan would love to thank our sponsors and the companies that we were fortunate to work with this past year. We look forward to working with each of them again in 2017, and encourage our customers who may be in the market for these products to check them out. We firmly believe in partnering with only the best companies and best products. We rely on these products and companies on a daily basis for each guide trip. These companies have proven themselves to us not only as being outstanding companies with the best products available, but also as companies with whom it is a pleasure to partner. We are proud to work with each of these companies, and are confident that they will surpass your expectations as they have ours. Humminbird makes the best fishing electronics on the market, whether it’s on the open water or on the ice. With a wide variety of products to choose from spanning many different price points, Humminbird is a proven leader in easy-to-use electronics that are also the leader in technology. The new Helix series is a game-changer in sonar, both on the ice as well as on our Sport Fish Michigan boats. Sport Fish Michigan will be featuring the all-new Ice Helix 7 on its ice trips for 2017. Other Helix units, like the 9 and 10 series, will be on our Sport Fish Michigan boats. Minn Kota makes the best trolling motors on the market without a doubt. The long-standing gold standard on bass boats has been a cable-driven Minn Kota trolling motor, but with the new Ultrex, the game is about to change. No longer will anglers have to make a choice between the ability to use the Minn Kota iPilot system or use a cable drive foot pedal like that on most bass boats. The Ultrex marries the two technologies together, and anglers can now have their cake and eat it too! With the immediate response of a foot controlled cable-drive coupled with the ability to spot lock with an iPilot system, anglers will have the best of both worlds. This brand new Ultrex will be on Sport Fish Michigan’s Ranger Bass boat for the upcoming 2017 season, and along with the Ulterra that is already on the custom center console, we will now be able to offer an even greater fishability to our customers. Under Armour is the maker of a wide variety of outdoor gear and apparel for a huge array of sports. With season-specific wear as well as sport-specific designs, Under Armour makes a superior product from top to bottom. From hats and gloves to shoes and boots, and long underwear to outerwear and everything in-between, Under Armour has us covered. Literally. Sport Fish Michigan’s Captains are lucky enough to be able to wear this awesome apparel, staying cool in the summer and toasty warm in the winter during our ice fishing trips. After two full seasons of wearing Under Armour gear, we can say that—without a doubt— Under Armour is a great company with fantastic products. Rapala is much more than a lure maker. Rapala brands together some of the industry’s best names. As a maker of lures, they make some amazing lures that catch boat-loads of fish for us here at Sport Fish Michigan. We use a variety of Rapala lures to target smallmouth bass, walleye, panfish, and even lake trout, brown trout, steelhead, and ciscos. In addition, Rapala makes some of the best jigging lure options for ice fishing, and along with their sister company, VMC, who manufactures some of the best hooks and jigs on the market, there are plentiful options for hard water anglers. 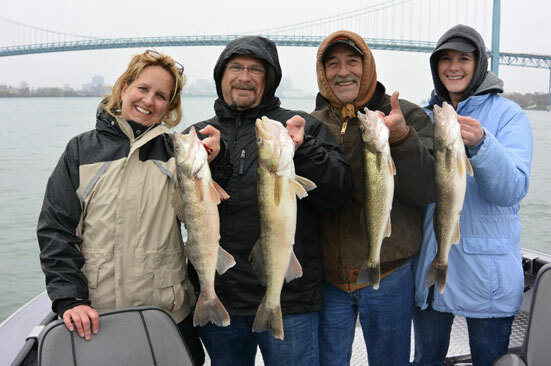 Shimano is the maker of the world’s best fishing reels, and makes the fishing reels that Sport Fish Michigan’s Captains rely on every day for every trip. Shimano produces a large variety of reels to suit a large variety of styles of fishing. For anglers preferring to cast, there are spinning reels and baitcasting reels for every budget. 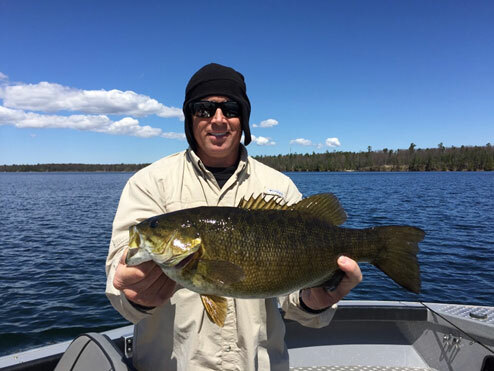 For our Traverse City Bass Guide Service company, customers use the Stradic Ci4 spinning reels, and the Curado baitcasting reels. These are true workhorse reels that have never let us down. For trolling lake trout, salmon, and walleye, Sport Fish Michigan Captains prefer the Shimano Tekota reels. The Tekota is a heavy-duty reel that is suited to the rigors of trolling, and its smooth, yet powerful, drag is second to none. G.Loomis produces what has long been arguably the best bass fishing rod on the market. Known for its amazing bass rods, G.Loomis also has a stellar lineup of rods suited for many other species. Some of the G.Loomis rods that we at Sport Fish Michigan use are the salmon and steelhead e6x lineup, and the walleye e6x series of rods. Both are workhorses for our guide trips and charters, not to mention the sensitivity, which is unparalleled. From casting rods to walleye trolling rods, G.Loomis has the best and most versatile rods available. Costa Del Mar’s tagline is #SeeWhatsOutThere for good reason. With the absolute clearest lenses available, Costa Del Mar produces the world’s best sunglasses. Available both in prescription and regular lenses, there are numerous lens options to choose from. The 580 lenses are what Sport Fish Michigan Captains use, allowing us to see just about everything. With a huge array of frame styles designed to fit a large variety of face sizes, there is something for everyone. Simms Fishing Products makes the best waders. Period. Simms has been the benchmark in wader technology, quality, and innovation for years. Coupled with their varied superior wading boots, these are the go-to waders for Sport Fish Michigan’s Capt. Ben Wolfe and Capt. Chad Dilts. Capt. Ben is also a Simms Fishing Products Ambassador, using many of Simms’ products throughout the year. From tackle bags to waders, and just about everything in-between, Simms is an outstanding company that we are proud to work with. Traverse City Tourism is the driving force behind much of the tourism in the Traverse City area. We have been blessed to have worked with the great people at the Traverse City Tourism for several years now, including a few photo shoots, article mentions, and now in 2017, our Traverse City Bass Guide Service has 5 great photos in its Visitor Guide publication. There is an accompanying article, and we were fortunate enough to have some fantastic centerfold photos taken by local photographer Dan Shepler. 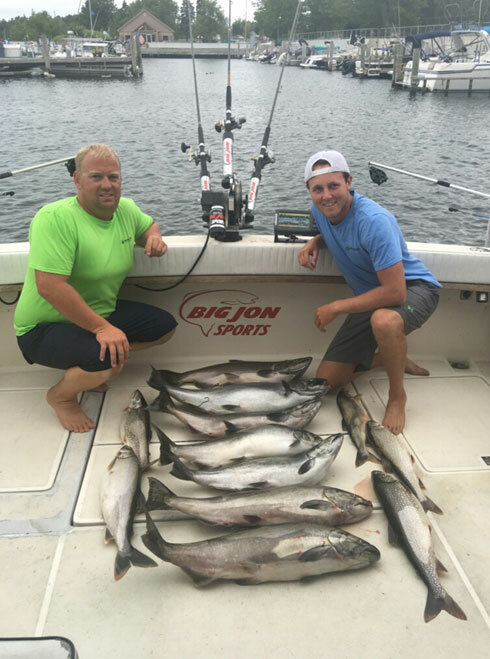 Yeti Coolers are what is in many of our Sport Fish Michigan boats, not only because of their amazing ability to keep cold things cold, but also for their superior durability. These coolers are the workhorses that we rely on to keep our catches cold in the larger 125-175 sizes, and our snacks and drinks cold in the smaller Roadie-35 sizes. Sage Fly Rods continues to make the best fly rods in the fly-fishing marketplace. Innovative designs in rod tapers and actions offer rods for every experience level. And with rod designs for a large variety of species ranging from fresh water to salt water, there is a rod for every angler’s desires. 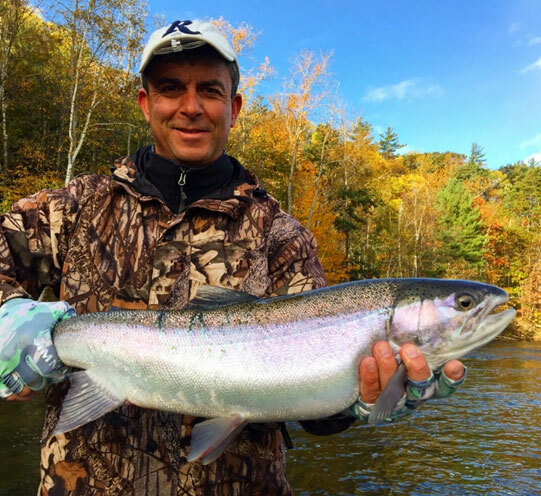 Sage fly rods, are the premiere fly rod for a reason, and we are proud to work with Far Bank Pros to bring these awesome rods to our customers’ hands during fly-fishing guide trips. Hatch Premium Fly Reels makes the most amazing fly-fishing reels. From an aesthetic standpoint, they are second to none. Sleek, eye-catching reel designs stand apart from the rest, while top-notch performance makes them the choice for Capt. Ben Wolfe for all of his fly-fishing customers and personal use. With absolutely butter-smooth drags capable of stopping salmon, bonefish, tarpon, and everything in-between, these reels are American made works of art! Cannon Downriggers are another product that Sport Fish Michigan Captains Ben Wolfe and Chad Dilts rely on for all their down-rigger trolling needs. With motors built to last year after year, Cannon builds a truly superior downrigger. Otter Outdoors manufactures the best well-made portable ice shanties—hands-down. Otter has incredibly well thought-out designs for both their flip-over style shanties as well as their hub-style shanties. Sport Fish Michigan uses both styles, and we absolutely love the insulated 1,200-denier fabric that doesn’t drip condensation as so many other shanties do. Our customers are toasty warm, even on the coldest and windiest of days. Built to last, these are truly fantastic shanties, and every customer has been impressed with their roominess, comfort, and quality. Angling Buzz was the creation of Lindner Media in 2016, with both a new website as well as a new television show. Sport Fish Michigan was proud to be a sponsor of the news-style Angling Buzz TV show in 2016, and is again for the 2017 season. 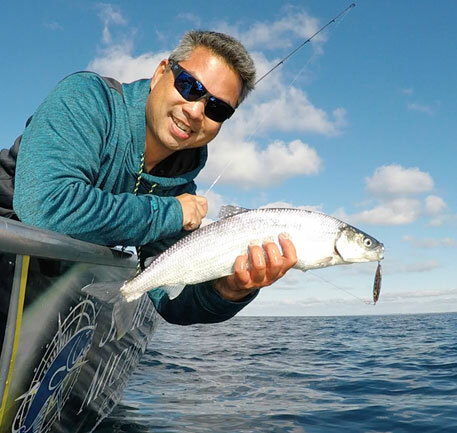 As a new concept in fishing television, Angling Buzz TV hosts up-to-date information and fishing reports from a wide variety of guides and anglers around the Midwest. 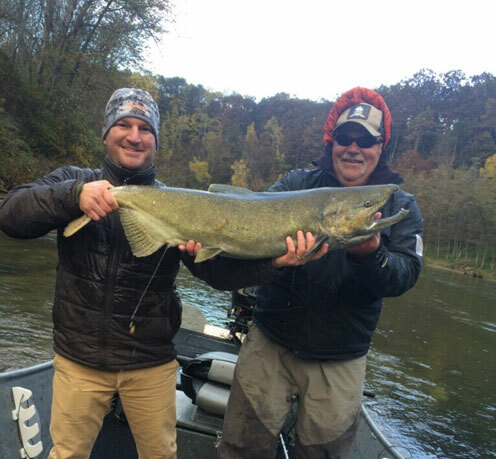 Sport Fish Michigan’s role was as Michigan’s only reporting source for the entire state. 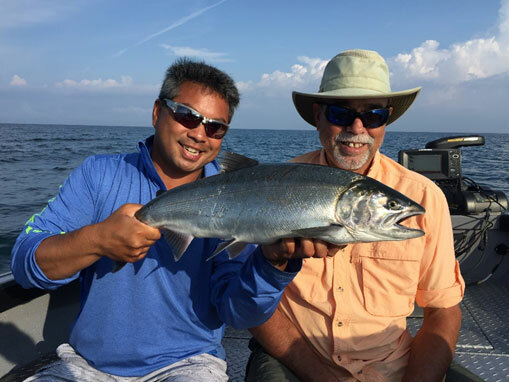 Sport Fish Michigan’s Capt. Ben Wolfe will be fishing and filming with Al Lindner during the 2017 season, putting together 2 different Lindner’s Angling Edge television shows. Hook n’ Look is hosted by noted bass professional Kim Stricker. Primarily a bass fishing show, Kim showcases the underwater environment, educating anglers from a fish’s perspective. This is an incredible learning tool, and Sport Fish Michigan has ben a proud sponsor of Kim’s popular show for the past few seasons. Additionally, Sport Fish Michigan and Traverse City Bass Guide Service’s Capt. Ben Wolfe has also filmed a few shows with Kim, in the crystal-clear waters surrounding the Traverse City area of northern Michigan. Ice Fishing – Surprise Largemouth Bass Catch! Capt. Ben Wolfe makes an incredible catch while ice fishing in northern Michigan – a largemouth bass! Capt. Chad Dilts of Sport Fish Michigan shares ice safety tips, demonstrating multiple methods to check for safe ice.